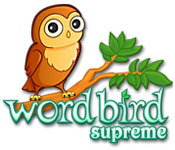 Word Bird Supreme is rated 4.2 out of 5 by 17. Rated 5 out of 5 by miansc from THIS GAME IS FUN ! Not only is this a fun game but it is addictive. I can't seem to go a day without playing this game. It is a little like Boggle Bash and Word Wipe. 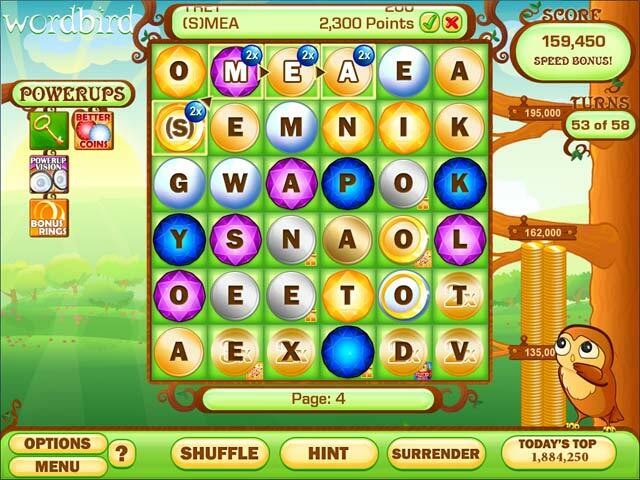 Word Wipe is a game you will find, for example, at Websites like online newspaper or Home pages. I bet if you search that game you will find it. When I saw this game it reminded me of both games. It is so much fun and a good game. 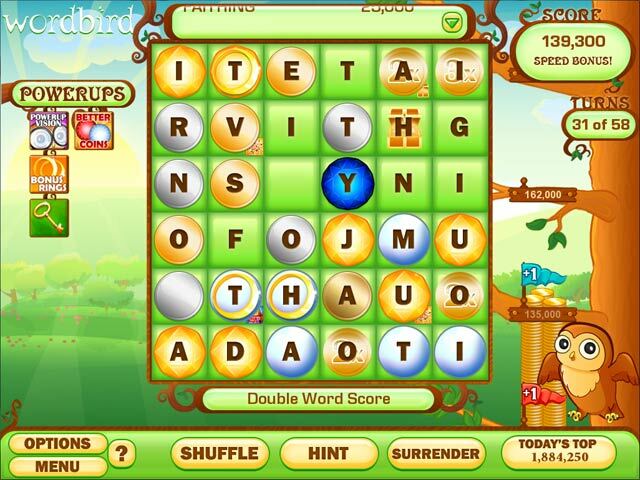 Word lovers casual or ad vide should really enjoy this game! Rated 5 out of 5 by evergreene13 from plenty of variations This is a relatively simple game but it's packed with options to keep it interesting. By far my favorite word game--I particularly like that the letters can be reused in each page (although no points are given after the first time). I also appreciate being able to choose which 'power ups' I want to have in play. I keep coming back to this game. Rated 5 out of 5 by RamClean from Fun but a problem Great game except for the fact that when you exit the game it moves all of your desktop icons to the left side of the screen. Rated 5 out of 5 by jeezlouise44 from Morning wake up This game has all the right components for a fine word game. I begin each day with the daily challenge. I don't always meet the challenge on the first try but it gets my brain in gear for the day. I am usually able to complete the puzzle. I am very happy with this game overall. Rated 5 out of 5 by Quincy_Fishing from Love Word Games! 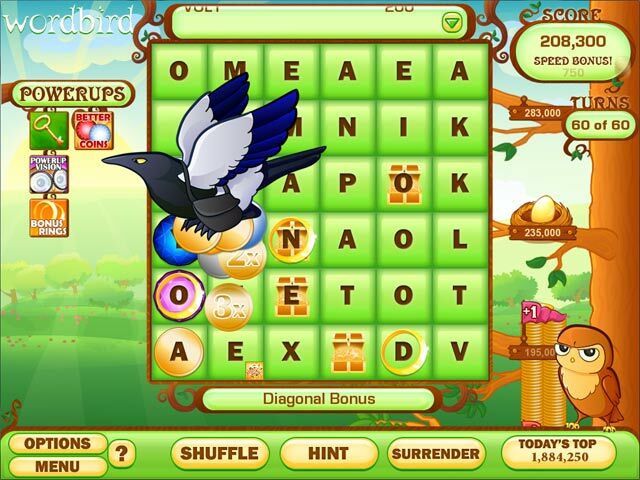 Fun word game, especially in the challenge mode or Hex pattern. I do like that it isn't timed; instead you have a certain number of moves. If you reach a point level you receive more moves a reward. If not, a crow comes and takes away your coins/letters and you lose. Nice game. Rated 5 out of 5 by LordGecko from The Slingo guys made a word game! This game is awesome! This is the guys behind Slingo and Solitaire Kingdom taking a stab at a word game so it uses their cool power-up and slot system. How this works, if not familiar with their other games, is when you first play the game you'll have access to one power-up and a single slot to put it in. As you complete games you'll slowly gain access to more power-ups and slots to put them in. You then are free to, within some limits, combine your favorite power-ups creating your own customized game experience. Even cooler, for a stat junkie as myself, they track your top score with every unique combination of power-ups as well as simply your best all time and daily scores. Rated 5 out of 5 by SrRat from Great little word game This game is a lot of fun. There are lots of ways to adjust the game, size of board, length of words, etc. The graphics, while simple, are engaging. The owl frowns if you don't perform! If you have a few minutes and want to exercise your word skills, or if you want to zone out and work on your vocabulary, this is the game.